What conditions does Coumadin treat? This medication can cause serious bleeding if it affects your blood clotting proteins too much (shown by unusually high INR lab results). Even if your doctor stops your medication, this risk of bleeding can continue for up to a week. Tell your doctor right away if you have any signs of serious bleeding, including: unusual pain/swelling/discomfort, unusual/easy bruising, prolonged bleeding from cuts or gums, persistent/frequent nosebleeds, unusually heavy/prolonged menstrual flow, pink/dark urine, coughing up blood, vomit that is bloody or looks like coffee grounds, severe headache, dizziness/fainting, unusual or persistent tiredness/weakness, bloody/black/tarry stools, chest pain, shortness of breath, difficulty swallowing. Tell your doctor right away if any of these unlikely but serious side effects occur: persistent nausea/vomiting, severe stomach/abdominal pain, yellowing eyes/skin. This drug rarely has caused very serious (possibly fatal) problems if its effects lead to small blood clots (usually at the beginning of treatment). This can lead to severe skin/tissue damage that may require surgery or amputation if left untreated. Patients with certain blood conditions (protein C or S deficiency) may be at greater risk. Get medical help right away if any of these rare but serious side effects occur: painful/red/purplish patches on the skin (such as on the toe, breast, abdomen), signs of kidney problems (such as change in the amount of urine), vision changes, confusion, slurred speech, weakness on one side of the body. List Coumadin side effects by likelihood and severity. Before using this medication, tell your doctor or pharmacist your medical history, especially of: blood disorders (such as anemia, hemophilia), bleeding problems (such as bleeding of the stomach/intestines, bleeding in the brain), blood vessel disorders (such as aneurysms), recent major injury/surgery, kidney disease, liver disease, alcohol use, mental/mood disorders (including memory problems), frequent falls/injuries. What should I know regarding pregnancy, nursing and administering Coumadin to children or the elderly? Some products that may interact with this drug include: capecitabine, imatinib, mifepristone. Does Coumadin interact with other medications? Should I avoid certain foods while taking Coumadin? For the best possible benefit, do not miss any doses. If you do miss a dose and remember on the same day, take it as soon as you remember. If you remember on the next day, skip the missed dose and resume your usual dosing schedule. Do not double the dose to catch up because this could increase your risk for bleeding. Keep a record of missed doses to give to your doctor or pharmacist. Contact your doctor or pharmacist if you miss 2 or more doses in a row. 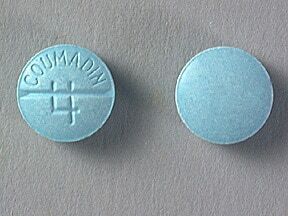 This medicine is a blue, round, scored, tablet imprinted with "COUMADIN 4". 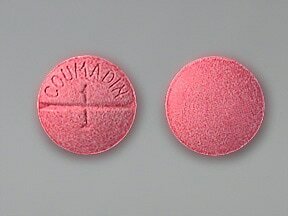 This medicine is a pink, round, scored, tablet imprinted with "COUMADIN 1". 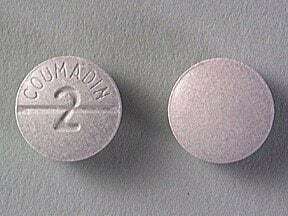 This medicine is a lavender, round, scored, tablet imprinted with "COUMADIN 2". 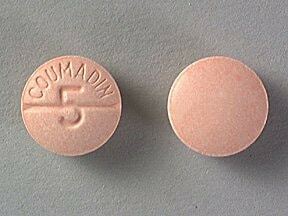 This medicine is a peach, round, scored, tablet imprinted with "COUMADIN 5". 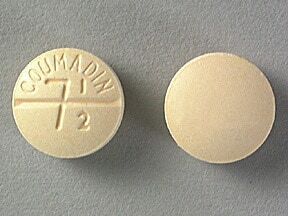 This medicine is a yellow, round, scored, tablet imprinted with "COUMADIN 7 1/2". 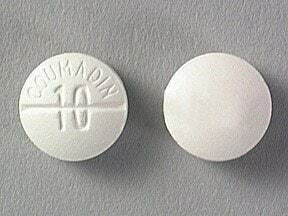 This medicine is a white, round, scored, tablet imprinted with "COUMADIN 10". 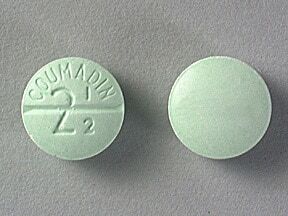 This medicine is a green, round, scored, tablet imprinted with "COUMADIN 2 1/2". 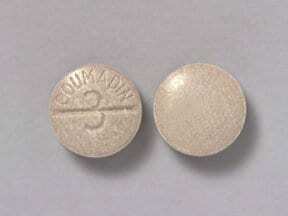 This medicine is a tan, round, scored, tablet imprinted with "COUMADIN 3". 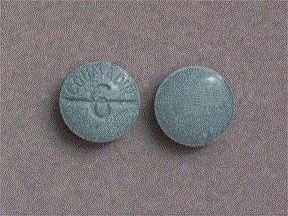 This medicine is a teal, round, scored, tablet imprinted with "COUMADIN 6". Are you considering switching to Coumadin? How long have you been taking Coumadin?